When a patient is missing a tooth, there are a number of replacement tooth options that can be considered to replace the missing tooth or missing teeth. A dental bridge is a fixed dental prosthesis used to restore missing teeth. As the name suggests, a dental bridge literally bridges the gap created by one or more missing teeth. 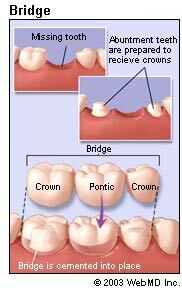 A bridge is used to replace one or more missing teeth that are in between healthy teeth. 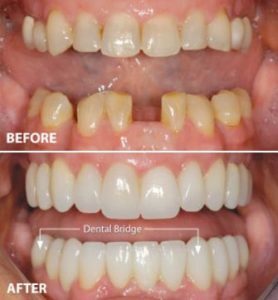 An example of what is possible using a dental bridge to restore a smile. Very aesthetic. A dental bridge restores your smile. Increased chewing functionality. Once in place, you are no longer missing a tooth, so you increase your available chewing surface. Prevent shifting or drifting of remaining teeth. When a patient loses a tooth leaving a vacant space in the mouth, the remaining teeth tend to shift and move into the open area. Oftentimes, this can lead to future problems with a patient’s bite or chewing ability. Fast tooth replacement option. Compared to other replacement tooth options, such as a dental implant, a bridge is a faster replacement option. Removes tooth structure. Because a dental bridge requires two abutments (adjacent teeth to keep it in place), the dentist prepares adjacent teeth by removing tooth structure. In some cases, this can be helpful if the adjacent teeth would benefit from a dental crown anyway. However, this option is not as advantageous if the adjacent teeth have no structural indications of needing a crown themselves. Higher risk of gum recession. Because the bridge is not anchored into bone, the bone under the bridge can weaken with time, and gum tissue may recede. Increased stress on adjacent teeth. Dental bridges put additional pressure and stress on the adjacent teeth that support it, which could lead to future problems. Dental Implant – Dental Implants Requires more healing time, but the adjacent teeth are not disturbed. Partial Denture – Partial Dentures are a great alternative due to cost, but they can be difficult to get used to. If you think you need a bridge, please contact us, and we can schedule an appointment to develop a plan of care. In the meantime, you can navigate back to our general services page or call our office at (406) 442-0282.